A programming utility for the Famicom that came packaged with the Famicom Keyboard and Famicom Data Recorder, plus a large manual to teach the fundamentals of how to get started with programming games. 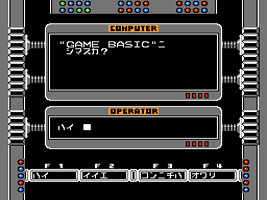 Family BASIC allows the user to program simple games in the customised BASIC language NS-HUBASIC (developed by Nintendo, Sharp and Hudson Soft). A updated version of Family BASIC, featuring more built-in games and a simplified user-interface. You can access a number of built-in minigames in Family BASIC V3, all of which feature elements from other Nintendo titles. Enter "GAME0" to play a game starring Mario and Pauline from Donkey Kong. 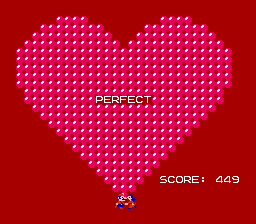 Either hold down a button or speak into the Famicom microphone to make a large heart appear. When it is complete, Mario and Pauline will run in from the sides. This scene also has some similarities to the between-stage scenes from early arcade title Sheriff. Enter "GAME1" to play the second game. 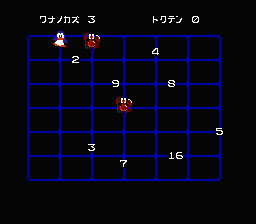 In it you play the penguin from Hudson Soft's Binary Land avoiding the Sidesteppers from Mario Bros. You can only walk on the blue lines as you collect the numbers in the right order. 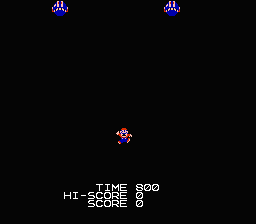 Enter "GAME2" to play a game starring Mario, avoiding the enemies that try to kill you. You have to make your own levels first though, otherwise Mario simply falls off the level and loses. Enter "GAME3" to play the fourth game, entitled "Star Killer". This is a 2-player game where you fly spaceships around a screen shooting at enemies. Several of the enemies are from other games, including the Fighter Fly from Mario Bros. and the Fireballs from Donkey Kong. Enter BG GRAPHIC mode, and scroll through the sprites you can use. You may recognise some of them from other early Nintendo games. 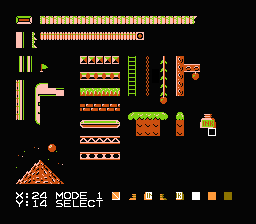 There are blocks, ladders, vines and girders from Donkey Kong, Donkey Kong Jr. and Mario Bros.
You can also edit Game 1 (see below) with the same tileset. Family BASIC has been quite poorly documented to date. A look at the game's tileset reveals a whole set of other characters that haven't been seen in the main game, including Shellcreeper from Mario Bros., Tori from Donkey Kong Jr. and a playable Pauline from Donkey Kong. These sprites also appear in Family BASIC V2, which doesn't appear to have built-in games. If you have more information on this, please contact NinDB.